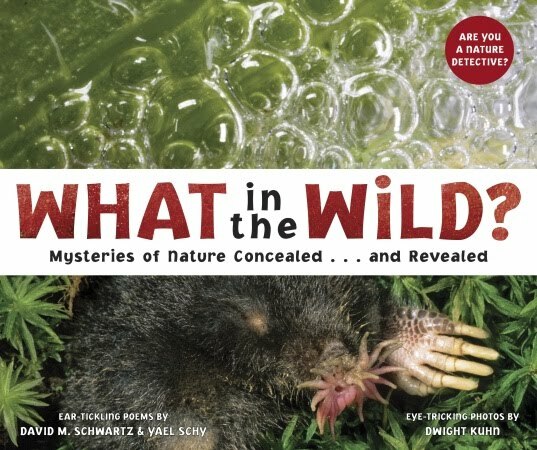 Wendie's Wanderings: Nonfiction Monday -- What in the Wild? What in the Wild? Mysteries of Nature Concealed... and Revealed by David M. Schwartz and Yael Schy. Eye-tricking photos by Dwight Kuhn. Tricycle Press, 2010. Available now. Here you will find mysteries in nature. Intro -- a poem riddle about the photograph on the opposite page. Can you guess what it is? Then lift the photograph to see another photograph under it with the answer, plus informaton about what you have found. The riddle poems are easy reading. sorta. "We're long and lithe, we wriggle and writhe." is probably a bit difficult for the first reader to understand. More nonfiction monday links can be found on Shelf Employed's Blog. The title and cover of this book alone are fabulous. It's nice to know the surprises inside are fun, too. Thanks for sharing!